All are encouraged to come and help review three designs from our architecture/permaculture team. 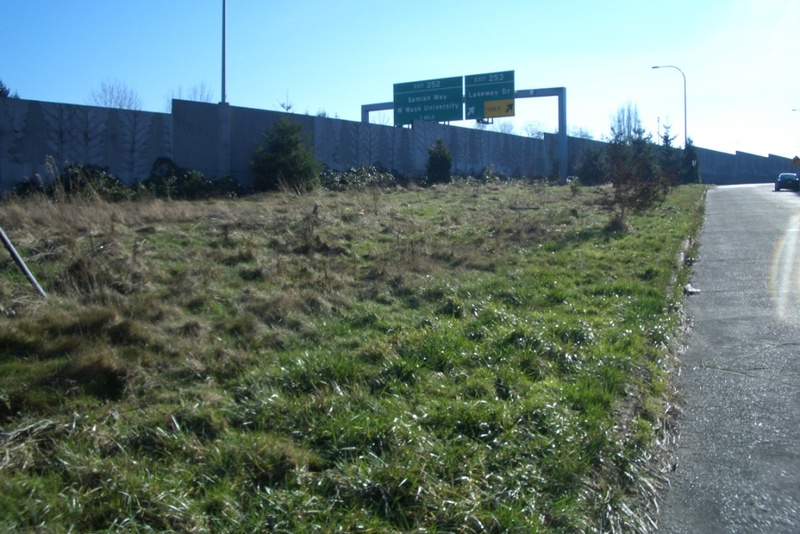 The designs are based on input from the community, WSDOT and SDOT. See insert. Sat Sept 28, 10-noon, Public Design Review Lunch will be served. Sun Oct 13, 2-4 Work Party. 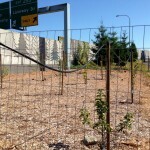 We need your help to improve the orchard space. Let us know if you can help with setup or take down. We will be ready for rain. We will have hot coffee and canopy cover! A hearty thanks to the volunteers who participated in our very profitable September 8th work party: Justin, Nancy M, Ryan, Sarah Lynn, Sue, Joan, Kristan, and Greg. What an accomplishment. Now is a good time to check-in about what we need to build upon our recent successes. Below are some tasks that no one has spoken for. Perhaps you could help us out. This entry was posted in Grants & Fundraising, Marketing & Outreach and tagged design, public meetings, volunteer on September 25, 2013 by Ruth. We have a cousin in the York Neighborhood of Bellingham. Mary Loquvam and Byron Bagwell are the instigators of York Farm and this year they are harvesting storage vegetables: potatoes, beans and winter squash. 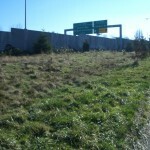 The farm has taken the place of a fallow piece of land along the Washington State Department of Transportation (WSDOT) I-5 right-of-way. The early discussions with WSDOT were about solar panels, but instead, the vegetable harvest became this year’s priority. Sunday, Sept 8 Weeding Party 2-4 Bring weeding tools and grass whips. Also, we need a volunteer to help coordinate the Oct 19 Cider Fest. Their food-sharing plan includes the Bellingham Food Bank and they are thinking of a BerkShare Dollars pattern where volunteers are paid in dollars that are redeemable for food. The local food Co-Op and other local businesses chipped in so the founders could offer two paid internships this year. The interns are learning skills to re-enter the job market. 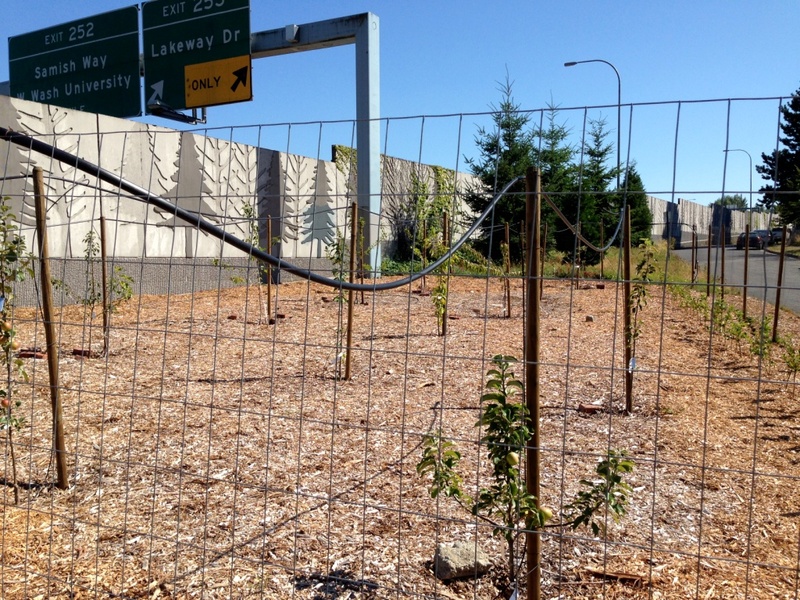 Mary hopes that the freeway garden can provide pathways to employment, in addition to the harvest. 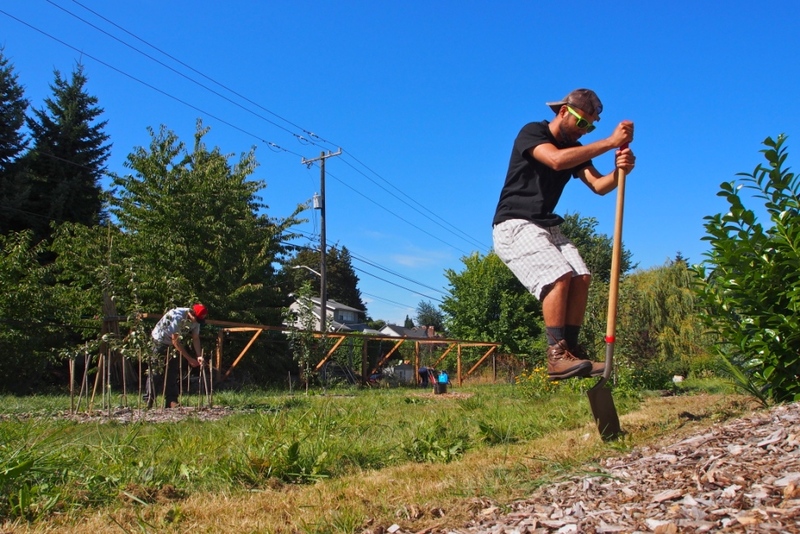 Their goal is intensive food production but they also created a community space. In June, the neighbors celebrated the Solstice at the farm. 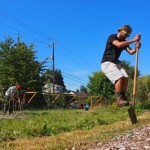 Congratulations to WSDOT; they now host two food forests on their property. This entry was posted in Marketing & Outreach, Plants and tagged food forest, solar, WSDOT on September 5, 2013 by Ruth.